Putush is a garden makeover company that specialises in creating green spaces out of the tiniest areas (think a wall, a nook or even a dull ceiling!). They also offer unique garden accessories made out of natural fibres like bio felt, coconut shells and bamboo (because pots are passe). Urban homes with minimum space and barely-there green cover. Oh, and if you're looking for garden supplies and plants, they have it all too. Started by Ashish and Dinesh, Putush has been offering green solutions to Delhites for four years. 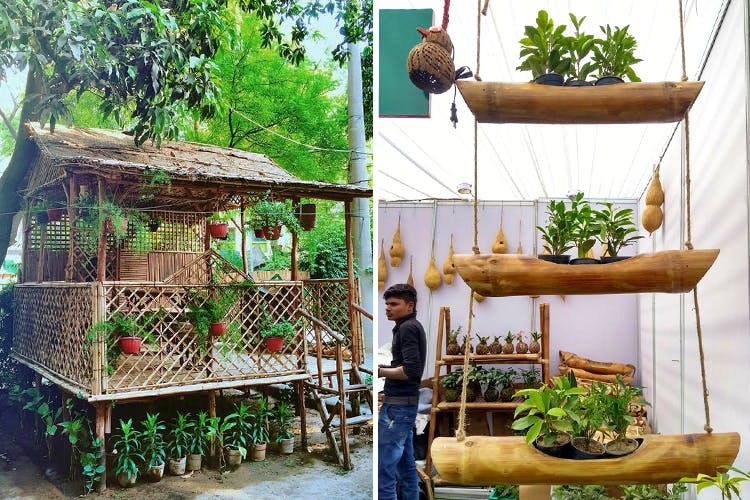 Over time, they've grown from a virtual garden accessories store to a makeover company that has gained corporate clientele and is a regular at many exhibitions too (including Dastkar, Noida Flower Show and more). What's so great about them, you ask? The fact that the folks at Putush can create a garden pretty much anywhere and they understand the needs of every urban city dweller struggling to find green cover and clean air. If space is an issue, the Putush folks can create portable garden walls for you. They've got a bunch of lovely hanging kokedama plants, tiered bamboo stem planters and even cute coconut planters with smiley faces. If clean air is your concern, these guys understand the process of air filtration well and know exactly the kind of plants that need to be placed in your home (keeping in mind the existing ventilation set-up). While you can always order/get in touch with them via Facebook, Instagram or their website, it would've been great if Putush had a physical store too (especially for last minute green gifts). In case you want to get a better idea of their products before you actually invest in them, drop by for one of the exhibitions the Putush folks participate in. Check out Putush's Facebook page for updates on their events and workshops. Price: A full-fledged balcony makeover (AI) starts at INR 18,000 and their garden accessories are priced between INR 100/150 (felt pots) to INR 1,000.